Me: Trying to sleep. Leave me alone. Brain: You know the door’s unlocked, right? Me: No, I don’t work tomorrow. Don’t need alarm. Brain: Yeah, but maybe it’s going to go off and wake you up. Me: I don’t care! I’m going to sleep! Brain: Are you sure you don’t work tomorrow? You better go check the schedule just to be sure. Me: Dammit, I just want to sleep! Why are you doing this to me? Hillary Clinton sits down with Zach Galifianakis on Funny Or Die for her most, er, memorable interview yet. September 11, 2001, Glendale California. Shortly before 6 a.m. A ringing phone wakes me up. I hear my girlfriend groggily answer it, and I can hear, all the way over on my side, the voice of her mother, upset about something. Lots of “What? What? What?” coming from that side of the bed. “What’s she on about?” I manage to mumble. It takes a minute for that very unlikely sentence to sink into my sleepy brain, but the answer was plain as day to me. “She’s must be watching a movie or something,” I said. “She says to turn on the TV!” There’s an urgency in her voice, and annoyed at what I think is her mom being confused and upset over nothing, I find the remote and turn on CNN. There it is. A gaping hole. Smoke billowing out. We can see flames. 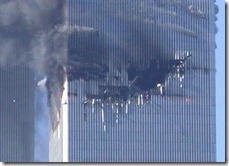 It must have been some massive failure of the air traffic control system, some huge computer foul-up. I tell her that somehow, some pilot wasn’t looking out his window, was looking at some instruments that were obviously completely screwed up, and flew right into the building. But then I start thinking about how many systems would have to break down for that to happen. And what would a plane be doing flying that low anyway? Still believing it was some small commuter plane, the CNN anchor breaks in and says they’re getting reports it was a jet. An airliner. 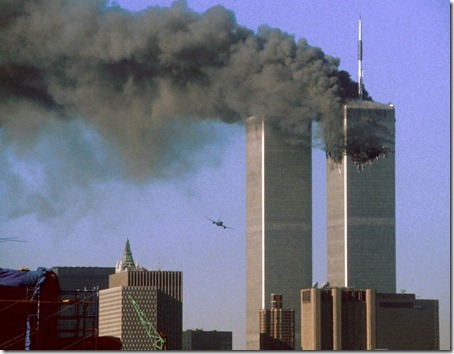 And as confirmations come in that it was a jet that hit the WTC, that’s when we see the second plane. Not sure of what we just saw, the news network (I can’t remember if we stayed with CNN or if we started flipping around) helpfully replayed the footage. Cecil the cat jumped into bed with us, wondering why we were awake so damn early and decided to capitalize on the opportunity and meowed for food. I don’t think our eyes left the television the whole day. I discovered Star Trek during its first renaissance in syndication in the early 70s, and the first episode I remember seeing is “The Corbomite Maneuver.” From that moment, I was hooked. I was just a kid, but that sparked a lifelong love affair with Trek and with science fiction. I devoured every book I could find about Trek – Stephen Whitfield’s The Making of Star Trek, David Gerrold’s The World of Star Trek and his book about the writing of the Tribbles episode, and the adaptations of James Blish. And just a few years after that, NBC gave us the Saturday morning cartoon, which I loved in all its cheaply animated glory. From there I began reading all the sci-fi classics I could get my hands on – Arthur C. Clarke, Isaac Asimov and more. Years later I fell in love with Star Trek The Next Generation and the cast became my TV “family.” In later life, moving to L.A., I met and became good friends with the aforementioned Mr. Gerrold, and got to hear stories from the Holy of Holies itself. Happy 50th anniversary, Trek!